Before your little trick-or-treater slips on that spooky costume and hits the candy-collecting trail, have her work on her maths, reading, writing, and critical-thinking skills with our year one Halloween worksheets. Activities include subtracting candy corn, counting spiders, a Halloween-themed vocabulary crossword puzzle, and a pumpkin patch maze. Looking to sharpen motor skills? Our cut-and-paste Frankenstein is a scary good time, as are pumpkin and ghost coloring pages. Get ready for Halloween with this spooktacular coloring page! Colour a pair of trick-or-treaters, dressed as a spooky ghost and lumbering Frankenstein. Get ready for some dress-up fun! This simple Tutu mask was inspired by our favorite flying character from Brainzy. Get ready for Halloween with this simple and fun jack-o'-lantern activity! All you have to do is colour and cut out the pattern to make a spooky decoration. Colour a werewolf kid and his haul of Halloween candy! Start your trick-or-treat adventure by coloring a witch kid filling up her bag of candy. Here's a 3D twist on the usual tic-tac-toe: a board game version with a Halloween theme. Play Halloween tic-tac-toe with haunted house and tombstone markers. Kids can practise their counting skills by completing this Halloween dot-to-dot witch. They'll also give their fine motor skills a boost as they work. 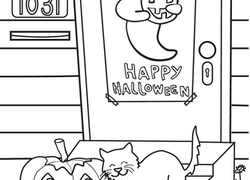 This cute Halloween cat coloring page is the perfect way to get your cat-lover in the mood for Halloween. Here's a cute coloring page that's sure to get your child ready for Halloween. It features a friendly witch going for a midnight broomstick ride with her cat. Celebrate the Halloween spirit with a creepy creature coloring page! Coloring is a great activity for building your child's fine motor skills. These foldable, fillable Halloween treat boxes are the perfect afternoon craft for a drizzly fall day indoors or as a fun Halloween party craft. An amphisbaena is a worm lizard, and a popular creature in Greek mythology and other ancient stories. colour the lowercase letter "a" and trace a new word! These kids are decked out in full Halloween costume, one a wild west bandit, the other a circus clown. Celebrate Halloween with a little black kitty and her jack o' lantern buddy. Kids can practise their counting skills by completing this dot to dot Halloween scarecrow. They'll give their fine motor skills a boost as they work. Get ready for a haunting Halloween, and enjoy a spooky coloring page! Your child will give the ghostly tree a little colour. The ghosts are all waking up one by one! Ask your child to quickly fill in the missing letters in the coffin and run home before he wakes up the other ghosts. Kids can practise their counting skills by connecting the dots on this Halloween cat. They'll also give their fine motor skills a boost as they work. Complete the maze by picking up all the pieces of candy on your trick-or-treating trail!